Induction Melting and Vacuum Casting - stainless steel, alloy steel, titanium, nickel base, copper base, cobalt base and aluminum. Melting for both investment and sand casting is performed using electric induction furnaces. Two 400 pound capacity box furnaces handle the larger pours. A smaller lift coil with a 200 pound capacity is used for alloys with lower melting points such as aluminum and brass. It is also used for smaller pours of non-ferrous alloys to reduce waste. All alloys are QC checked on our spectrometer prior to pouring and adjusted to insure conformance with specifications. Investment shells are pre-heated in a kiln before pouring to insure proper filling and minimize casting defects. 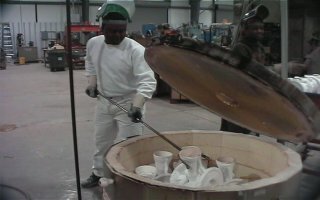 The molten metal from the box furnace is poured into a pre-heated ladle that is used to pour the molds. The lift coil furnace melts alloys in a crucible that is also used for pouring. The use of separate crucibles for each base alloy prevents cross contamination of the metals. Ceramic and glass cloth filters are used in each mold to eliminate impurities and inclusion from the metal as it is cast.